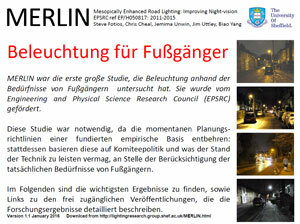 Unwin J, Fotios S. Does lighting contribute to the reassurance of pedestrians at night-time in residential roads? Ingineria Iluminatului, 2011; 13(2); 29-44. 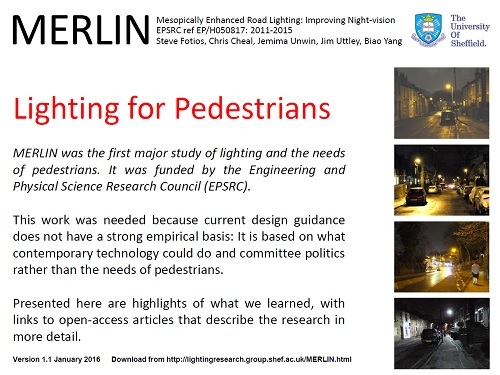 These slides give a concise summary of the pedestrian research carried out at Sheffield University under the EPSRC-funded MERLIN research project. The slides include links to open access articles giving further details of the research carried out. The S-series of lighting classes in BS 13201-2:2003 and BS5489-1:2003 specify lighting standards for residential streets: these are primarily an average pavement illuminance of 2 to 15 lux with a reduction allowed when using lamps of high colour rendering index. Compared to other countries, these illuminances are high: for example, Australia tends to use average illuminances of only 0.5 or 0.85, and Japan uses 3 to 5 lux. It is clear that politics and convention have taken precedence over visual needs. Many studies have attempted to improve the way the existing standards are applied, but none have addressed the fundamental questions of what needs to be lit and how. 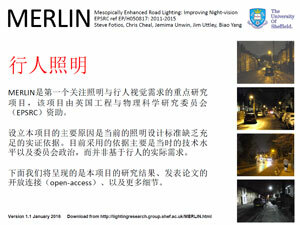 The MERLIN project is a collaboration between vision science (Prof John Barbur, City University) and lighting engineering (Peter Raynham, UCL, and Steve Fotios, Sheffield University). This project will provide a fundamental review of what pedestrians need to see and do in residential streets to be safe and to feel safe, how lighting affects these tasks, and thus what optimum design criteria should be. We suspect that better lighting can be provided and energy consumption reduced. Identify what pedestrians look at when walking along residential streets at night. This will be done through an eye-tracking study and a reassurance study. Determine by experimentation how these tasks are affected by illuminance, spectral power distribution and illuminance uniformity. In parallel studies the MERLIN project will investigate fundamental properties of vision and the performance of applied tasks. Determine optimum design criteria for lighting design in residential streets. We also intend to demonstrate the resultant optimum lighting schemes to the public and lighting professionals by installing new lighting schemes in several streets. This will be done following determination of the optimum criteria and discussion of these at international research fora. We have been offered equipment for these trials by lighting equipment suppliers so this task should be achievable without needing to gain further external funding. We have made good progress in understanding of what is important to pedestrians, how this is affected by lighting, and of methodology in these investigations. What matters? Jim Uttley used eye tracking to record the visual fixations of pedestrians: he worked with 40 participants who walked a route containing variations in surface topography, interactions with other people and variations in reassurance (perceived safety). Eye tracking tells you where a person looks, but does not tell you if the objected being fixated is important for safe walking. To do this Jim used a dual task (responding to a randomly occurring noise), the additional cognitive load helping to isolate which fixations were critical: for this we inspected the fixations when response to the dual task was particularly slow. Interpretation of these data suggested that other people and the footpath are critical fixations, the objects pedestrians want to see for safe walking. It is important to observe other people to judge their likely behaviour, e.g. whether threatening, friendly, or indifferent; it is important to observe the footpath to detect (and subsequently identify) obstacles that may be potential trip hazards. This conclusion may be somewhat common sense, but it has not previously been demonstrated by empirical data. We are planning to repeat this work to investigate the critical fixations of cyclists and wheelchair users. In parallel, Jemima Unwin sought to establish whether the presence of lighting matters to people: does it affect their decision as to whether it is safe to walk alone, after dark, in a particular location. While many studies have investigated the benefit of lighting before, it is likely that the methods used unintentionally led to the conclusion that lighting was important, a biased response. What Jemima did was to ask volunteers about places where they would and would not feel happy about walking alone after dark, purposefully avoiding mention of lighting and fear or safety. The results show that lighting is considered to be an important factor in route choice decisions when walking after dark. How Much Light is Needed? We are investigating how the amount (illuminance/luminance) and spectrum of road lighting affect the performance of three critical tasks: interpersonal judgements, obstacle detection, and reassurance. The focus had been on facial recognition, but identity recognition is not the same as making an evaluation about behavioural intent. We decided instead to study facial expressions. There had been no consideration as to methodology, and how variations in procedure might affect the conclusions drawn from an experiment. While past studies had reported the distance at which facial recognition was achieved they had not asked whether this was a desirable distance for the decision to be made. Distance is critical because it affects the visual size of the person. Similarly, there had been no control over the duration of observation. This work was carried out by Biao Yang. The aim was to use examine how lighting affected ability to evaluate faces portraying the universally recognised emotions: happy, sad, fear, disgust, surprise and neutral. First, we examined whether these emotions lead directly to judgements of intent, i.e. threat or non-threat. The low level of consistency in these judgements suggested not. Hence instead we examined the ability to recognise these expressions directly, a forced choice task. Faces were presented on a non-self-luminous screen, in order that we could control the amount and colour of lighting without the confound of screen light. With this set up we could control the interpersonal distance (size of face) and duration of observation, and it overcomes limitations of the stop-distance procedure used in previous work. The results show: (1) higher luminance leads to better recognition, but a point is reached (the plateau) beyond which increasing luminance further has little benefit; (2) lamp spectrum has little effect on expression recognition. In parallel Biao examined the characteristics of interpersonal judgements. Consider the distance at which it is desirable to make a judgement about the intent of another person, this perhaps being sufficient to walk in a different direction to avoid the person. This was not addressed in previous work and we did not consider that Hall’s proxemics, the standard reference, was appropriate for, nor even intended by Hall to be used, for this decision. Biao undertook a second evaluation of Jim Uttley’s eye tracking videos to identify the distances at which other people were fixated: the conclusion was for other people to be fixated at a distance of 15 metres. Biao also recorded the duration of fixations on other people and concluded a typical duration of 500 ms, making the real task much more difficult that the constant fixation employed in previous studies using the stop-distance procedure. Two further studies of interpersonal judgement have been carried out. In Biao’s tests, the non-self-luminous screen rendered the colour images of faces to be near grey-scale under the low (mesopic) light levels used in tests. Hence Holly Castleton carried out a supplementary test of facial expression recognition, but using a new apparatus constructed to maintain image colour. This apparatus employs a data projector in which the standard lamp is replaced by a test lamp (e.g. high pressure sodium), with the projection screen back-lit by an identical lamp. The intention was that this apparatus would reveal an effect of colour on expression recognition if there was one: initial results do not suggest this to be significant. We are fortunate to work with Yandan Lin and Mengdi Dong (Fudan University) on investigation of methodology in facial recognition experiments. The results of a first experiment prompted a task-difficulty theory: the identification recognition task is more difficult than the matching recognition task (the two most common procedures in past work) because in the identification task the face is unfamiliar at the point of observation, and this increased difficulty is more likely to yield an effect of spectrum. A second experiment examined variations in luminance and observation duration: the results suggest that a measure of exposure (luminance * duration) may provide a useful indication of performance. Current experiments are examining expression recognition when the target and reference faces have different expressions, thus to avoid a direct pattern recognition, and comparing recognition of 2D (screen) and 3D (sculpted) faces. Obstacle Detection. We have previously investigated obstacle detection in a project funded by Philips Lighting. Peripheral detection was measured using a scale model apparatus where the visual field was exposed for 300 ms and test participants reported which one, if any, of six obstacles were raised. That project demonstrated that higher luminance and higher S/P ratio increased detection, for older and younger observers, with a plateau-escarpment relationship between luminance and performance. A second experiment was carried out with a greater number of luminances to better define the relationship. We also explored how these data might be interpreted to yield the optimum luminance. One approach sought to identify the point of diminishing returns in the curve of obstacle detection versus illuminance, and for a 95% probability of detection this was approximately 2.0 lux. The second approach sought to identify expectations of the end user, which in this case is the local authority providing the lighting which needs to be able to show that it has taken reasonable steps to protect against trip hazards. For an obstacle of height 25 mm at a distance of 6m (this subtending a visual arc of 13.5 minutes) an illuminance of 0.6 lux is required for a 95% probability of detection (by young people under HPS lighting). The decision as to which of these approaches is appropriate has further consequences: using the first approach, giving the higher luminance, the effects of SPD and age do not appear to be significant, but using the second approach, giving the lower luminance, then age and SPD are significant effects. Limitations of this work are that the observer is static, they are encouraged to focus on a fixation point, and there are no distractions as happens in real situations. We therefore built a pedestrian simulator to overcome these limitations. Test participants carry out the test whilst walking on a treadmill, thus adding to their cognitive load. Rather than a fixed fixation point we use a moving point (simulating the motion of the eyes in natural settings) and this point changes randomly to a numeral, this giving observers a dual task. This work is being carried out by Jim Uttley. Initial results suggest that the dual task does prompt better retention of visual fixation on the intended fixation point than does the standard approach of simply instructing fixation on a fixed point. This apparatus will be used to confirm the effects of illuminance and SPD as were found in the scale model experiments. Reassurance. Having demonstrated that lighting matters for reassurance, Jemima Unwin is investigating how much light is needed. Past studies have used rating scales to investigate how light levels effect reassurance in different roads. There are many problems with this approach, with one issue being that reassurance is affected by other factors in addition to this. What Jemima therefore did was to capture ratings of reassurance for a location in daytime and after dark, and use the difference between these ratings as an indication of the effectiveness of lighting. This was the method used previously by Boyce et al (2000) and effectively uses the daytime rating as a control for environmental effects on reassurance. Results will announced when the analysis is complete. Acknowledgements. Thanks to Peter Boyce, Chris Spencer, Stephen Farrall, Lisa Newton, Declan Walsh, Yandan Lin and Mengdi Dong for their contributions to this work.